© Copyright 2016 CAND.com.vn, All rights reserved. The Presidium of the Vietnam Fatherland Front (VFF) Central Committee and the National Assembly’s Standing Committee have collected 3,480 opinions and petitions of voters and people nationwide after the fifth session of the 14th legislature. 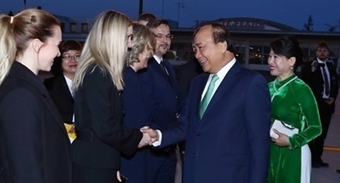 The content of voters and people’s petitions and opinions was detailed in a report presented by President of the VFF Central Committee Tran Thanh Man on the first day of the sixth session of the 14th NA in Hanoi on October 22. He emphasized that voters and people have expressed their confidence in the leadership of the Communist Party of Vietnam, activities of the legislature, and the management of the Government. Based on the collected opinions and petitions, the VFF Central Committee’s Presidium proposed the Party and State instruct the intensification of information popularization work about issues of public concern in order to create consensus among the society and consolidate people’s trust. The VFF said better popularization work will raise public awareness of and vigilance against sabotage plots and tactics of hostile forces, and promptly countering and preventing the spread of fabricated information that stirs up public worries. The Government should continue to steer ministries, agencies and localities in restructuring the economy; improving productivity, quality, efficiency and competitiveness of the national economy; pushing ahead with international economic integration and administrative reform; providing timely support for businesses in terms of mechanisms and policies, while promoting the development of all types of businesses, especially private enterprises and new-style cooperatives, the VFF said. The VFF also urged the Ministry of Natural Resources and Environment, and local authorities to strengthen land management; review and amend policies and legal regulations, especially those regarding land reclamation, thus ensuring publicity, transparency and harmony of interests of people, State and businesses. Regarding the educational sector, the VFF report called for the strict handling of violations of regulations related to examinations; further improvement of the quality of education-training and vocational training; and the compilation of quality textbooks for schools. The VFF also called for actions to swiftly settle the imbalance in the number of teachers among regions, and more attention to the planning and construction of educational and medical facilities in new urban areas and industrial zones. The VFF asked the NA, the NA Standing Committee and the Government to continue improving the quality of lawmaking, and promptly issue documents guiding the implementation of laws. Party agencies and organisations of the Party and the State, and administrations at all levels should raise the sense of responsibility in reshuffling the apparatus in tandem with streamlining personnel, the VFF said, highlighting the responsibility for setting examples in implementing tasks and fighting corruption and wastefulness of heads of the agencies and organiations, officials, Party members and public servants. At the end of the morning session, Chairman of the NA’s Economic Committee Vu Hong Thanh presented the evaluation of the implementation of the NA’s resolutions on the socio-economic development plan in 2018, three-year implementation of the 2016-2020 plan and the socio-economic development plan in 2019.